Running Down the Walls (RDTW) 2013 is quickly approaching! This year’s event will take place in Hamilton ON, and be held on Saturday, October 26th at the Workers Arts and Heritage Center on 51 Stuart Street, from 1-4pm. Everyone is welcome to come out in support of our imprisoned comrades and allies. This international event is held every year in support of prisoners, and against the prison system that confine them. This year’s event is in support of North American political prisoners and (im)migrant prisoners across Ontario. The October 26th event will center the voices (im)migrants with experiences of incarceration in Canada. Collect sponsorships to raise money in support of political prisoners and (im)migrant prisoners. Visit rdtw-north.com for the fund-raising forms. Sponsor a prisoner who is participating in Running Down the Walls in support of political prisoners and (im)migrant prisoners. Visit rdtw-north.com for the list of prisoners participating in the event in support of (im)migrant and political prisoners. Join us on October 26th from 1-4 p.m for free food, and speeches that focus on (im)migrant experiences of incarceration, and the experiences of long term political prisoners. During the event we will run/walk/bike/and roll 5 kilometers in support of our imprisoned allies. This year’s fund-raising effort will be split between the ABCF Stipend program to support long-term political prisoners, and material support for (im)migrant prisoners in Ontario, which will be facilitated through Books to Bars Hamilton. Running Down the Walls (RDTW) began in 1999 at the Leavenworth Federal Penitentiary in Kansas. With the assistance of The Anarchist Black Cross Federation, the event’s aim was to raise financial support for people who have been imprisoned fighting for freedom and against injustice. Since its first run, RDTW has grown to be an international event held in many cities and prisons across Mexico, US and Canada. It has also come to represent so much more. Predicated on racial and social inequality, the (in)justice system and the prison industrial complex are inherently political in how they govern our lives, oppress our desires, and tear apart our communities. That is why people from the community join with prisoners to participate in a small, yet important act of solidarity that everyone can take part in. Most importantly, RDTW is an event to highlight the struggles faced by imprisoned people and to provide an avenue for their voices to be heard. Joseph Bowen, Russell Maroon Shoatz, Tsutomu Shirosaki, Alvaro Luna Hernandez, Herman Bell, Maliki Shakur Latine, Ruchell Magee, Sundiata Acoli, Hanif Bey, Sekou Kambui, Oso Blanco. These prisoners are largely serving multiple decade or life-sentences for their involvement in defending their communities against racism, colonialism and State violence. This program will work in collaboration with migrant justice organizations throughout Southern Ontario, prisoner support groups, (im)migrant organizations in the region, and local (im)migrants in and around Hamilton who have (family) experiences with incarceration. Books to Bars (B2B) has spent a considerable amount of time developing a strategy for getting ESL/Alternative Language materials into Southern Ontario Prisons. At this point, they have developed a targeted strategy to outreach to and engage with imprisoned (im)migrants in Southern Ontario. a B2B will provide stock ESL reading materials to the various prisons and Detention Centres, provide essential legal material and establish personal contacts with people being detained, so as to solicit requests and provide individualized titles. An ongoing focus of the initiative will be to establish substantive correspondence with imprisoned migrants to better understand their unique struggles and needs. This initiative comes on the cusp of a growing number of (im)migrant prisoner engaged the struggle to better their current conditions. After relocating nearly 200 imprisoned (im)migrants two hours away from Toronto (where most of their families and communities are located), the prisoners struck against the Central East Correction Centre (CECC) and against the dehumanizing condition they are expected to endure. United in struggle, they presented the jail and Canadian Border Service Agency (CBSA) with a list of the most basic demands. These demands include better access to medical care and social workers, cheaper phone calls and access to international calling cards (many have family overseas), access to better food, like the food on the non-immigration ranges, an end to constant lockdowns, keep the improved canteen program going and better access to legal aid and legal services. Additionally, detainees are demanding that the CBSA grant specific requests to move individuals to facilities nearer to their families, legal resources, and social services. Given that CBSA leases the cells from CECC and thus both aim to save money, these basics needs are even less accessible for imprisoned (im)migrants than they are for the general population. Until there are no more prisons and no more borders, we must stand in solidarity with those who are forced to struggle day to day for justice and dignity. 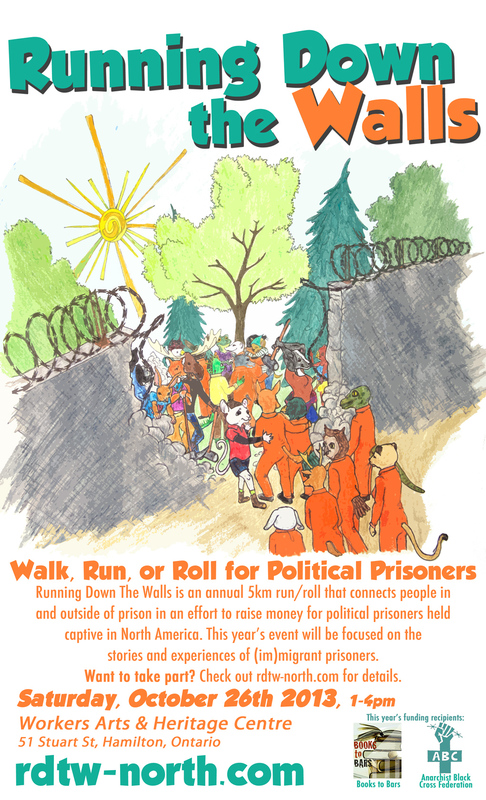 So this year, on October 26th you can participate in the 5k run/walk/bike and roll marathon in solidarity with others across North America both inside prisons and on the outside.